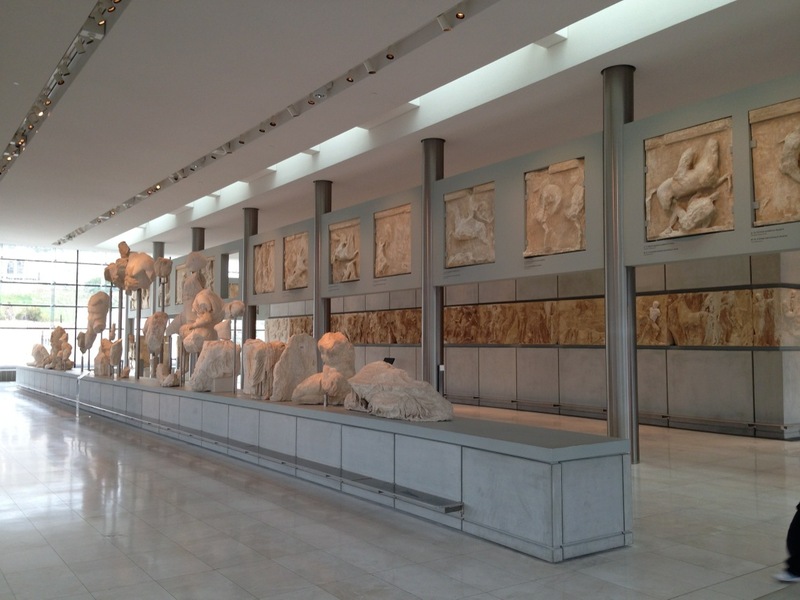 As you approach the Acropolis Museum in Athens you see the Parthenon’s reflection floating in the dark glass wall of its topmost level. It’s an optical trick worthy of the ancient temple builders themselves, bringing the most celebrated monument of European culture from its hill into the city, from the past into modernity, from worship into museology. The museum itself expertly fulfils current aesthetic and educational norms, providing an ideal showcase for sculptures that are now between two and three thousand years old. But it’s that dark glass room that is the climax, the showstopper. Aligned on the axis of the Parthenon rather than the building on which it stands, it reproduces the temple’s proportions and form through lines of steel columns around the central walls. Those columns, with their pediments, have come to define European culture through their countless imitations in buildings aspiring to worldly or spiritual authority. UNESCO uses them to signify universal human culture. 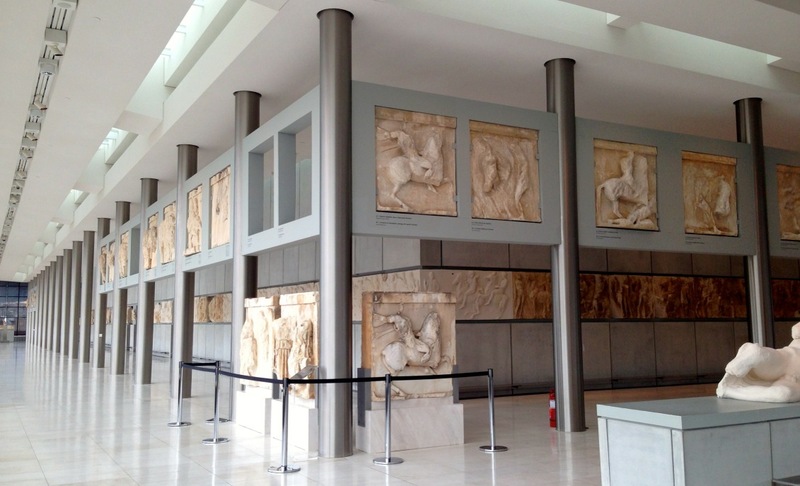 The idea of replicating the Parthenon, visually and spatially, is brilliant and it offers a memorable visitor experience. It also allows those parts of the original sculptural design that are not in the British Museum or elsewhere to be displayed in their original relationship to each other. Sadly, however, the passage of time has left many of the actual sculptures little more than pale shadows of their original selves. Rain, wind and frost, fingers. chisels and gunpowder have all left their marks. Some stones still carry beautiful images that seem to connect one with the people that made and venerated them, but it requires an expert eye to identify meaning in others. The wonderful caryatids – which bring Athens to the Euston Road – stare out of their ruined beauty like a chorus of Miss Havishams. And that’s without taking account of the fact that sculpture was typically coloured in the classical period to enhance its mimetic effect. The white purity we associate with Athens and Rome is the product of time and the Enlightened imaginations of men like Johann Winckelmann. As I walked respectfully with other visitors around this latest effort to recall the wonder of the Parthenon from the lost time, I felt that we too were worshippers. The cult has changed but its essential purpose remains. 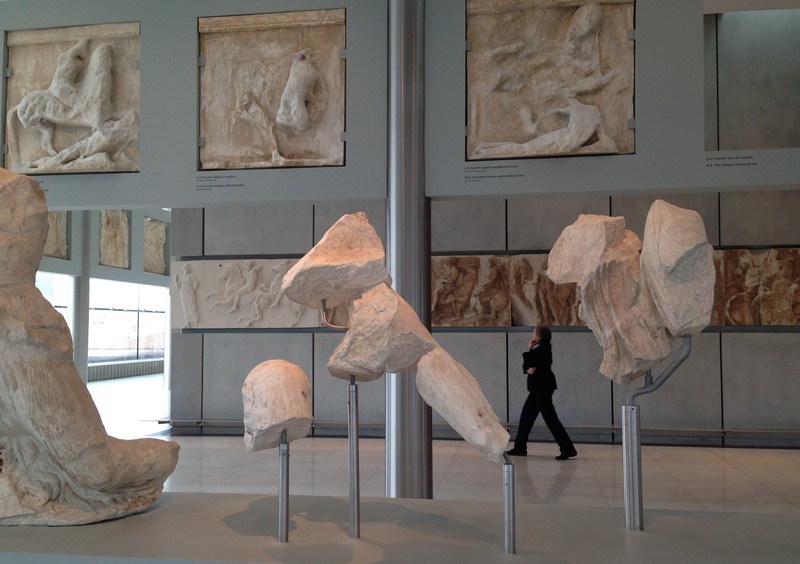 We were here to honour an idea, a belief, a set of values, represented by some very worn pieces of marble. Objectively, many of them were no longer very beautiful, or even much like what they had once been. But the continuity of their existence gave them authenticity. These were the stones Phidias and his followers had carved. 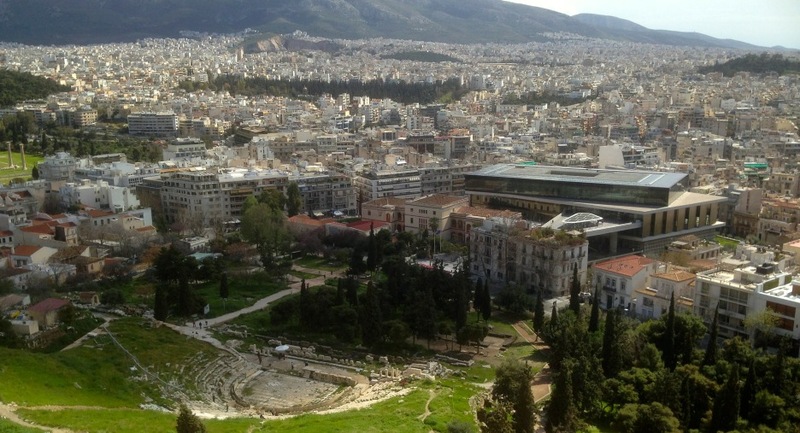 This was where Socrates debated and Plato taught, where Pericles praised democracy and Thucydides untangled history from myth, where theatre was born, scientific observation formulated and the foundations of philosophy laid. Being here paid tribute to ideas that are the touchstones of the society we want to be. But, as the faithful have always known, it’s hard to maintain one’s ideals outside the temple, in the rough and tumble of the world. We would better honour those Athenian ideals by being more honest democrats, more truthful thinkers and more creative artists than by touching these stones.